all your friends see itwith or without popcorn. "We have to pass the [healthcare] bill so, eh, we can find out what is in it." This is the terrifying statement that was made by House Speaker Nancy Pelosi on the eve of passing Obamacare in the Housebecause she was not kidding. No elected member of Congress wrote the bill. And none were given a chance to read it. And, frankly, none wanted to read it because they feared if they did they could not, in good conscience, vote for it. Credit is given on page 158 of the Patient Protection and Affordable Care Act to the senior staffers on the Hill who helped the lobbyists for the princes of industry and the barons of banking and business write the bill. On page 158 they were exempted, by law, from having to be covered by Obamacare. You gotta ask yourself just what's so bad in that legislation that senior staffers, who are not Congressmen or Senators and are, thus, not exempt from the legislative misdeeds they help create, would demand a provision be added to the bill that specifically exempted them from having to be covered by it? Have we become as placid and complacent as the Jews who sat in the Nazi death camps of Auschwitz waiting for a chemical shower and a quick drying off in a hot furnace? 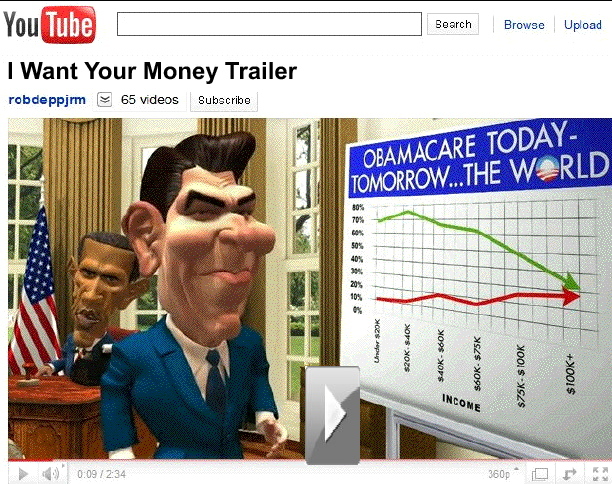 In the "trailer" (above) the cartoon Obama notes that he "...learned in school that spreading the wealth is good for everyone." The cartoon Reagan counters that he learned "..from real life that it's not. In fact, there's a word for it. It's called theft!" Most Americans don't realize where the $787 billion in "stimulus spending" went. Except, of course, they know it didn't go where the politicians promised it was going. It was supposed to jumpstart the economy, get the foreclosed mortgages off the books of commercial bank to free up their ability, under Fed rules, to begin lending money to consumers again and, of course, to save failing banks. The Bush-43 stimulus ($600 billion) which was supposed to loosen credit but didn't because Bush's Treasury Secretary, Henry Paulson, didn't. That money was funneled to Fannie Mae and Freddie Mac to keep them from going bankrupt from guaranteeing loans to home buyers whose only source of income was welfare. And, as a result, consumer lending pretty much dried up, setting the stage for an Obama win in Nov. 2008 from stolen votes surrpetitiously cast by Obama surrogates. About 35 million of them. That brought on the Obama stimulus which was actually the start of a global redistribution of wealth designed specifically to impoverish America and the other industrialized nation as everything denoting affluence is transferred to the emerging nation in a complete reversal of fortunes in the world. Obama campaigned on a promise of change. He had to save the banks in order to jumpstart the economy. Only, he forgot to tell his minority constitutents that the banks he was going to save and the economy he was going to jumpstart were not in the United States. They were in the emerging nations where US banks had loaned too many uncollateralized dollars to third world banks. Had those banks failed, its likely the domino affect would have brought down every central bank in the world and collapsed all of the world's economies, bringing about economic Armageddon. Reagan, who actually did say social progressive spending was theft, was right. It is theft because the Constitution specifically states what Congress can spend tax dollars on. Congress, using sleight of hand, construed the explanatory preamble to the Constitution to be enumerated rights that granted to the federal government the authority to spend money to safeguard everyone's welfare and to promote commerceand/or to control how it was done and what people could or could not do. And every Congressman and Senator who voted in the blind to enact these spending bills not only needs to be thrown out of office, they need to be thrown into prison. And so do the robber barons who bought their souls. 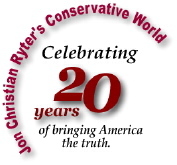 Copyright © 2009 Jon Christian Ryter.